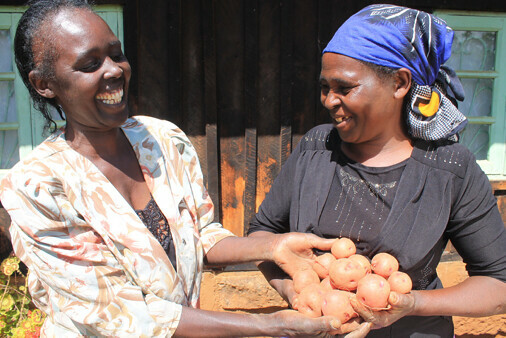 Mary Kinya is a Village Potato Advisor (VPA) for Buyene village in Meru, she says, “For so long I have lived a life of poverty, yet that does not kill my spirit”. From her hard work, Mary’s life has taken a turn in the right direction. Mary is one of 72 decentralized seed multipliers also known as VPAs in Meru County who will help improve productivity and profitability for potato farmers. Through offering advice and related services to farmers on good potato management, the VPAs become the focal point to information that can support the growth of their potato plots. As with many other small-holder farmers in her village, Mary would use recycled seed bought from a local market and plant randomly. In spite of her hard work, the productivity of her farm was low resulting in poor harvests. Meaning she never produced enough to sell. Through the intervention of the AVCD Potato value chain component in partnership with Farm Input Promotions Africa (FIPS-Africa), Mary adopted the use of clean seed potato, correct spacing, good hilling and timely spraying in January 2017. She put these practices to use when setting up her seed multiplication plot. Under irrigation, she planted 350 kg seed potato of Sherekea variety. In April 2017, Mary harvested 3,740 kg of clean seed potato (equivalent to 10.7 tonnes/acre). She was in disbelief. If had she planted the 350 kg of recycled seed without adopting the good agronomic practices, the VPA would have harvested less than a third of that amount (1,200 kg, equivalent to 3.4 tonnes/acre) of potato. After sorting the 3,740 kg the VPA got 2,240 kg of seed potato and 1,500 kg ware. “I saved 1,190 kg seed potato for replanting!” she smiled. 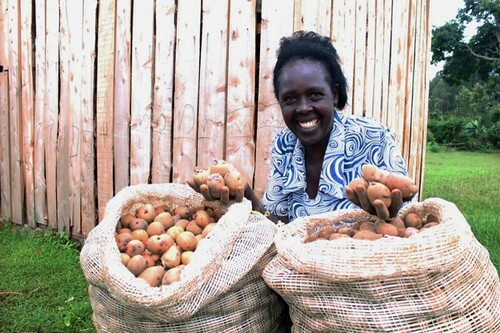 She sold 1,050 kg seed potato at KES 50 (USD 0.5) each, making KES 52, 500 (USD 525). She also sold 1,350 kg of ware potato (seed meant for human consumption) at KES 30 (USD 0.3) per kg, making KES 40,500 (USD 405). From the sale of seed and ware potato, Mary made a total of KES 93,000 (USD 980) from her 0.35-acre plot. “After deducting the cost of production (KES 34,400), I made a profit of KES 58, 600 (USD 586),” she says (equivalent to USD 1,674 per acre). She’s continued to plant clean seed potato, harvest and sell to small-holder farmers in her village, and slowly she has started to improve her finances. Mary has invested part of her savings to build a diffuse light store (DLS) where she stores her seed as she waits for the tubers to sprout (pictured in photo above, behind the VPA in image 1). DLS encourage production lots of small sprouts instead of one long sprout. Many small sprouts lead to more stems and tubers, and this can double yields for farmers who buy and plant well-sprouted seed potato. But Mary has not profited alone; farmers in her village are ecstatic too. “I have made sure that the knowledge I was taught is passed on to the farmers in my village so that we all grow together; that way we can kick that hard life of poverty out of my village,” she giggles. At the beginning of the project, Mary gave 1 kg trial packs of certified seed potato to 100 farmers in her village together with advice on good agricultural practices to sample on their own plots. After sampling the certified seed and seeing the difference in productivity, a majority of the farmers came back to purchase larger quantities of clean seed potato from her. Priscilla Gituma is one of the farmers who received 1 kg trial pack of Sherekea variety in June 2016. “I looked at the number of tubers and thought it was a joke but Mary taught me that it was meant for learning. From the 1 kg I harvested 11 kg of in November 2016!” she says. “In late July 2017, I replanted 10 kg and then I ordered an additional 50 kg from Mary,” she explains. Priscilla harvested 760 kg in December 2017, had she planted 60 kg of local seed, she would have harvested less than 300 kg from the same piece of land. Priscilla is now confident of where to get clean seed potato and reliable potato advice is just meters away. She is now very optimistic that her potato production will grow and is looking at going commercial. VPA Mary Kinya giving a farmer 1kg pack seed potato tubers to plant on her own plot in Mbuyene village Abothuguchi West Credit: FIPS ward. “I believe my work has paid off and potato farmers now appreciate the value of planting clean seed potato. A total of 51 farmers have pre-ordered between 10 and 50 kg clean seed potato from me for next season,” she said enthusiastically. Tags: CIP, Kenya, Meru. Bookmark the permalink.